Hey Tampa Bay, Jodi here with an arts and culture in Tampa Bay update for ya! Step in time to the Straz Center for your chance to see the Tony Award winning musical, Mary Poppins. The Practically Perfect nanny makes an easy transition to the stage by blending the best of the P.L. Travers stories and the classic Walt Disney film. Because of the blending of stories, the musical is fresh but familiar and Practically Perfect in every way. The set design is whimsical with some of the dark touches P.L. Travers put into her stories, the stage looking as if it was ripped from the pages of a storybook. Some parts may be a little scary for young children, like a scene where toys come to life and scold the Banks children, but overall the play is delightful and kid-friendly. While the two hour and forty minute run time, including a twenty minute intermission, may be a bit long for small children, it did not seem to be a problem for many of the kids who seemed too wrapped up in the magic to realize it was past their bedtime. You won’t get bored with this Jolly Holiday of a musical. Bert is as wonderfully funny, and perhaps slightly more animated, on stage as he is in the movie. All the characters are more developed and play well off of each other, especially Mary Poppins, herself. You’ll be rooting for the Banks family as they grow and bond throughout the play. Kids will learn important lessons about character and family and adults might learn something too. All the while, you’ll be singing along with all your favorites like “Supercalifragilisticexpialidocious”, “Spoonful of Sugar” and “Chim Chim Cher-ee”. Mary Poppins will be at the Straz Center through June 6 with regularly priced tickets starting at $23.50. 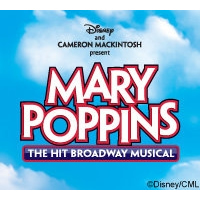 This musical is truly a treat and will let your imagination soar like Mary Poppins and her magic umbrella. For Tickets and more information, visit www.strazcenter.org or call 813.229.STAR (7827), and stay tuned in for more Tampa Bay area events updates.